The salon is a place where the genuine care and needs of our guests’ hair is our highest mission. We pledge to provide the highest possible service for our guests who will always enjoy a warm, relaxed ambience. The Grove Experience enlivens the senses, instils well being and fulfils even the unexpressed wishes and needs of our guests. 365 is a set of values and principles by which The Grove Experience is run. It has key elements such as 5 step which aids us in producing fabulous haircuts with consistent, first class personal service, where continual learning is recognised as key to helping designers reach their full potential. It is the 21 guidelines to greatness. It is about being better and different, It is about fashion and trends. It is about amazing people doing amazing things. It is about together everyone achieving more. It is about being the best you can be. It is about having fun, making money and being number one! It is about high achievers, It is about fairness, compassion and kindness. We are proud to have been associated with 365 for over 20 years now. The Grove Experience believes every business has a social responsibility in the way it behaves. We believe as a society everyone needs to “do their bit”. Some of the ways we are attempting to do this are outlined below. As a business we are committed to using and supplying fair trade products wherever possible. Currently all our tea, coffee, cocoa and sugar is Fair Trade. We are now registered as a Fairtrade business. We will minimise energy wastage with simple measures such as turning off appliances at the end of the day. The Tea Tree brand in Paul Mitchell is completely carbon neutral, Paul Mitchell plant enough trees each year to offset the carbon emissions created producing and shipping the product to market. They work with the Rainforest Alliance to help make this happen. We take all our glass, plastic and cardboard to recycling centres to get it processed. We even give some of the hair we cut off to our guests to keep the deer off their gardens. Very energy efficient washer / dryers to reduce our power and water usage are used in the salon. 2019 sees the business add as plastic free champion, by Surfers against sewage. the salon has worked to reduce the amount of plastic items used by the business and to recycle all plastic or repurpose items where possible. We have now removed all plastic drinking straws from the salon and replaced them with new Bamboo ones. Sells new CiD cosmetics and products in glass containers with a natural origin without micro beads. offers guests refreshments in ceramic, china and glass containers. As far as we are aware none of the products we sell or use in the salons are tested on animals. 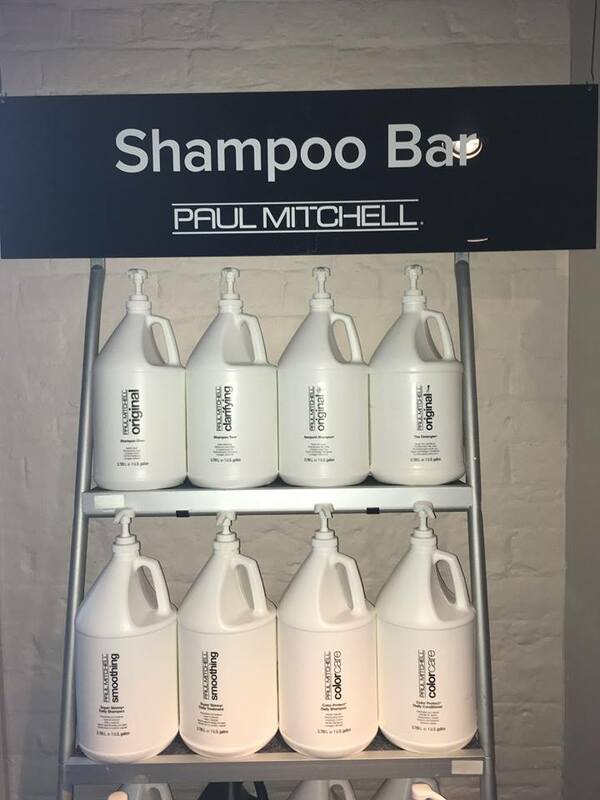 We are proud to have been associated with Paul Mitchell since its launch in to the UK 25 years ago. Paul Mitchell has never and will never test on animals. All products are tested on humans, even their pet products. ALL Paul Mitchell colour products that we use in the salon are Vegan safe, as are 90% of all Paul Mitchell hair products (All products are vegetarian friendly)and None have ever been tested on animals. The salon gets involved with charitable events which the team can have great fun at . We also work all year round raising money for our two chosen local charities, RNLI and St Wilfrid’s Hospice in Eastbourne. It’s our way of giving a little something back. 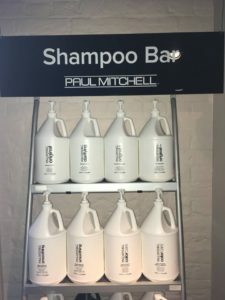 As a Salon a currently sponsor the Hair salon running in St Wilfrids Hospice, Supplying Paul Mitchell Products for use in the salon. A number of our team give up their time to volunteer in the Hospice salon. We have been working with the Coco’s Foundation to raise money to help orphan children many of whom have HIV living in Zulu Natal. In October 2018 Gary traveled to Africa to help build a house for the children. In 2019 Kiki and Emma will also be traveling out to Zulu Natal to again help build a couple of houses for the orphaned children. In the local area the team have been able to set up a community Coat rack outside the salon for people to get warm coats during the winter, the team have also volunteered in their own time to do haircuts for the homeless in Eastbourne along side the Salvation Army. Just by using Paul Mitchell Products we are both giving back. Paul Mitchell donates a percent of its profits each year to worthy causes, whether that’s feeding children in Africa, clearing landmines, helping disaster victims or buying up areas of forest so it can’t be built on.